Welcome to the world of Voodoo! Learn black magic and play for your life! 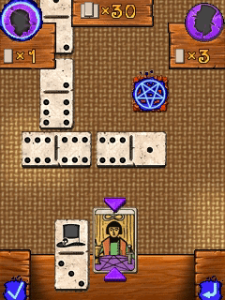 Voodomino spices up the traditional Game of Dominoes with dark rituals and deadly curses. Play against your friends and lure them into sneaky traps. With luck on your side you can influence your future. Each tile has its own motif, from poisonous snakes to powerful Voodoo dolls. Can you acquire all the magic tiles? The winner is the player who is first to get rid of all his tiles. Only tiles with the same image can be placed down. Tiles with two identical motifs are double tiles which can be placed down in four different directions. "LEMOON" HQ homescreen clock Saint Berlin presents a new king-size designer desktop clock collection. "LEMOON"